Alexandre Antonelli falls silent for a couple of seconds. He turns a little in his chair, choosing his words with care. Alexandre Antonelli’s office in Gothenburg is like an open book about his life and his research. One moment he’s pointing out the town where he was born – Campinas in Brazil – on a large map of South America that hangs on the door. The next, he’s leafing through the enormous Flora of Ecuador books that were a source of inspiration during his undergraduate studies, or showing a giant seed from one of his many research trips to remote forests and mountains in the tropics. He’s used to thinking on a big scale, and believing that things can be solved. He took his bachelor’s and master’s degrees in two and a half years instead of four (“I studied evening courses, weekend courses, summer courses – everything!”), and became a professor at the age of just 36. 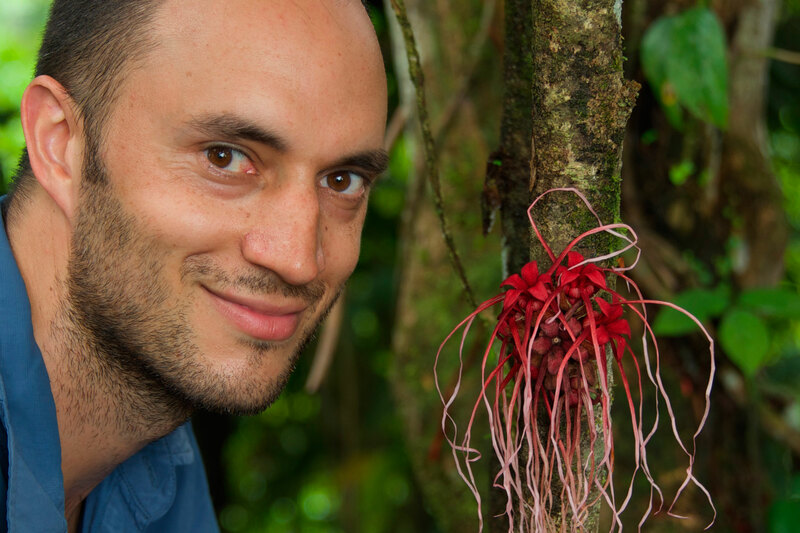 Although natural science researchers often specialise in a certain type of fish or plant, for example, Alexandre takes a somewhat wider approach: his field of research is South America. This subject is called biogeography, and South America is an excellent area for researching it. Together with Central America and the Caribbean, this region is known as the neotropical zone. The zone is home to more species of plants and animals than any other region on earth. Today, Alexandre leads a successful research team. His ambition is to include a broad field of researchers in the team – from evolutionary biologists to systematists, geologists, mathematicians, computer scientists and ecologists – in order to obtain an overview of how biological diversity has developed. He carries out research trips to South America four or five times a year, for two to three weeks at a time. These trips are planned in great detail, in order to be as effective as possible. They often consist of gathering plant and animal samples and cooperation with local universities, such as arranging symposia or workshops. One of the challenges within Alexandre’s research field is a lack of data. Tropical regions have been the subject of considerably fewer studies than Europe and North America, despite the fact that they feature a much wider variety of species and supply the rest of the world with food and raw materials. He sees it as being essential to develop new and improved methods for analysing data and assessing the reliability of researchers’ results. Another challenge involves gathering and coordinating research work about biological diversity. Here, Alexandre draws a comparison with the work carried out by particle physicists in Switzerland in the CERN project. He himself has started a research network that encompasses a number of different subject areas, and he believes that the University of Gothenburg could play a key role in coordinating the work involved with future biological diversity research. Alexandre won the Faculty of Science’s research award this year, and his eyes light up at the mention of this. He hopes that it will help to promote the subject of biological diversity so that it eventually becomes a profile area for the university, and is increasingly seen by the general public as an incredibly important, positive area that deserves particular protection.